The same principles apply to the nursing career. The good news is that nursing is one of the safest career paths when it comes to job security. According to the BLS Occupational Outlook Handbook, by 2020, nurse employment is expected to grow by 26%, faster than the average for all occupations in the U.S.
Continue reading to find out more about what a nursing career can offer and what specialties are the most sought after. Is There a High Demand for Nurses? At the moment, there is a clear and significant shortage of nurses in the U.S., which makes the demand to fill in nursing positions to continuously grow. This demand is mostly due to the fact that the average age of nurses in the U.S. is over 50 and growing, which means that they are approaching retirement. A 2015 National Nursing Workforce Study shows that 50% of U.S. RNs are 50 or older and the Health Resources and Services Administration predicts that within the next 10 to 15 years, more than one million registered nurses will be retiring. Moreover, a 2017 AMN Healthcare survey shows that 73% of the boomer-age nurses (RNs over 54 years old) plan on retiring in the next 3 years. This leaves a great number of nursing jobs available but also rushes healthcare facilities to employ more nurses faster to facilitate the transfer of knowledge and expertise. How Many Nurses are Employed in the U.S.? 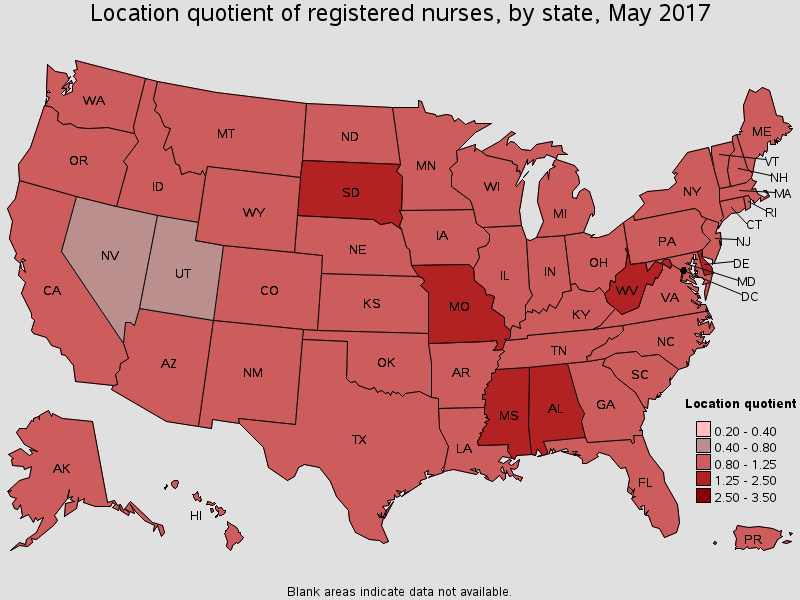 Despite a clear shortage, the number of registered nurses working in the U.S. has grown continuously. Nursing also demands administrative tasks. From 2001, when there were around 2.2 million registered nurses employed in the United States, the number of nurses employed in the U.S. has grown from 2.8 million in 2016 (shows statistic.com) to over 2.9 million in 2017 (announced by the Bureau of Labor Statistics). What’s more, this number is predicted to grow even more in the future, across all nursing specialties. In What Type of Organizations are Nurses Most in Demand? Although the most common workplace for a nurse is a hospital, there are several other health care settings where a registered nurse can work. Depending on what nurses enjoy most about their jobs, specialty preferences and the type of patients they are most interested in serving, an RN can have quite a few options. Usually, a healthcare setting brings nurses face to face with a wide range of patients, giving them the chance to treat several different health issues and expand their knowledge. That is why most registered nurses prefer to work in such places. The long hours and difficult cases you encounter in hospitals can be physically and emotionally draining so not everybody can face all of these challenges. Sometimes, after a few years of hands-on experience, some nurses will want to work in a more relaxed environment, with better working hours. Outpatient personal settings, such as house care. That being said, when it comes to the biggest number of available positions for nurses, hospitals will always be in first place. How Many Nurses Work in Hospitals and What is the Hospital Demand? At the moment, data published by the Bureau of Labor Statistics shows there are over 3 million employed license nurses, which comes to roughly 30% of all health professionals and yet the demand for nurses has always exceeded the supply. A nurse working in a hospital. The Bureau also shows that the largest employers of registered nurses were hospitals (state, local, and private), where 61% of all RNs work, followed by ambulatory health care services, that employ 18% of RNs. The number of RNs working in hospitals has only increased, as the percentage has grown from 57% recorded in 2012 by RWJF. The rest of registered nurses work in nursing and residential care facilities (7%); government (5%); and state, local, and private educational services (3%). How Many Nurses are still Needed in a Hospital? Despite the large numbers of nurses working in hospitals, BLS also projects a shortage of more than 1 million RNs by 2022. Several studies have shown a strong correlation between the number of RNs working in the hospital and the outcome of patient care. 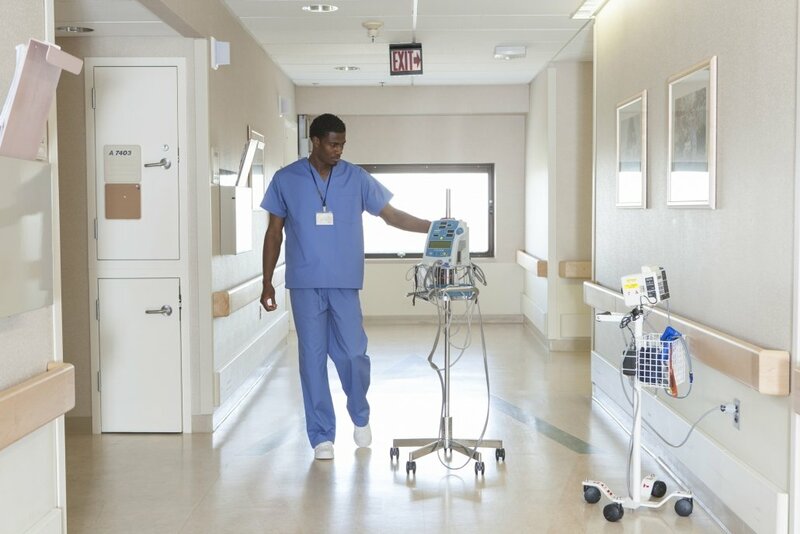 Mandatory staffing policies in the U.S. require between 4 and 7 patients per nurse in general acute wards during the daytime. Moreover, the National Institute for Health and Care Excellence explains that if the threshold of 8 patients per nurse is surpassed, the hospital is exposed to major risks. This context, combined with the current efforts to increase the number of RNs with BSN qualifications from 50% to 80% by 2020, makes a bachelor’s degree a future necessity. With tens of thousands of jobs already available in the U.S. for registered nurses with a BSN degree, it’s safe to assume the number will only grow in the near future. Increase your RN status and take a look at an RN to BSN program! 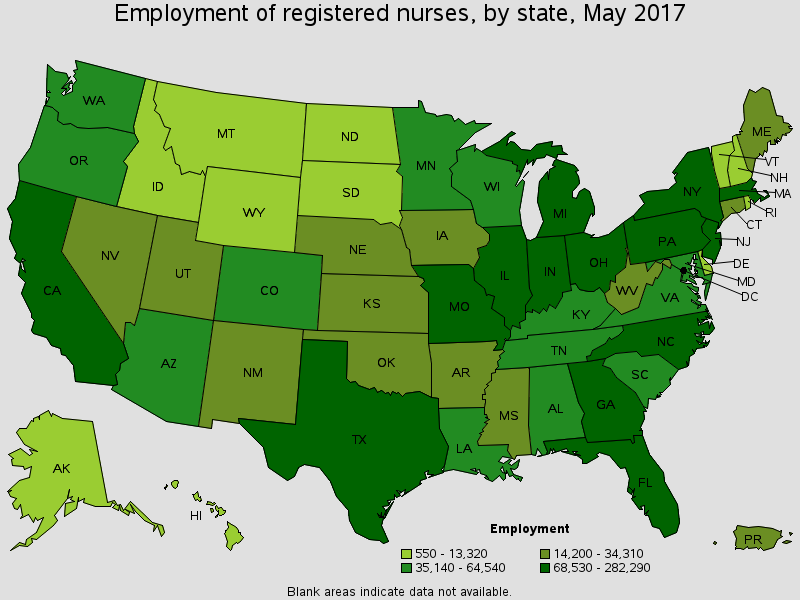 The states with the least need or nurse employment are Alaska, North Dakota, Wyoming. When it comes to the highest concentration of jobs, states like South Dakota, West Virginia, Delaware, Missouri, and Mississippi seem to offer higher job availability than states like Nevada or Utah. Depending on job qualifications, there are several levels of getting into a nursing position. Nursing Aid or Assistant: This is a position that offers an insight into a nursing career, although it is not technically considered a nurse and have to receive on-the-job training, because a nursing assistant does not hold a license. Certified Nursing Assistant (CNA): Unlike a regular nursing aid, the CNA holds a certification, but they are trained in a limited range of procedures meant to support registered nurses. Due to this limited training, a CNA is usually required to work under the supervision of the RN. Licensed Professional Nurse or Licensed Vocational Nurse (LPN/LVN): They are mostly in charge of communicating patients’ needs to the medical staff and can also carry on limited responsibilities, such as collecting patient records, administering injections, prepare surgical procedures or, in some cases, even performing small procedures like starting an intravenous drip. LPNs or LVNs work under an RN or a doctor. Registered Nurse (RN): With a more advanced education and training in the field, RNs have already passed a nursing exam and have received licensure, as well as an associate or bachelor’s degree. They are in charge of direct patient care in medical offices, hospitals, clinics, and other healthcare facilities. Besides all the responsibilities that come with direct patient care, RNs can also consult and make recommendations to doctors and offer training to CNAs and LPNs. Advanced Practice Registered Nurse (APRN): An APRN is a registered nurse who obtained a master’s degree and has gone through additional training and specific clinical practice. This means that several specialties can fall under the spectrum of APRN, such as Nurse Practitioner, Clinical Nurse Specialist, Certified Nurse Midwife, and Certified Registered Nurse Anesthetist. Doctor of Nursing Practice (DNP): As in every field, a doctorate is the highest degree you can get. 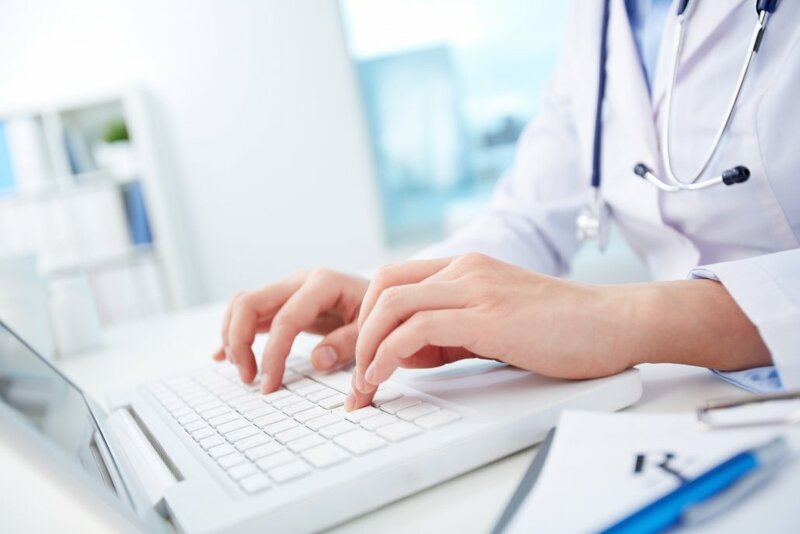 While it is not to be confused with a doctoral degree for physicians, the DNP degree offers nurses the skills to make diagnoses in certain situations and even to set up a course of treatment. Depending on the nursing attributes that you are passionate about, you should follow your career path until you meet the requirements. For instance, if you love to communicate with patients and are not interested in administrative roles, an RN licensure or a BSN degree might be the perfect goal, while if you wish to spend less time with patients and focus more on the medical procedures, it is wise to follow a master’s or even a doctoral program. It’s all about where your strongest qualities lie. However, it is important to note that if pursuing a higher-level degree, a BSN degree is a requirement for many degree programs. What is the Nursing Education Scheme? From a simple nursing diploma to a doctoral program, there are several steps nurses should follow depending on their desired job and the time they can put into their education. You can start your career with a diploma, to see if this is truly the path for you, or you can follow an Associate Degree Program (ADN) or a bachelor’s program to become an RN. 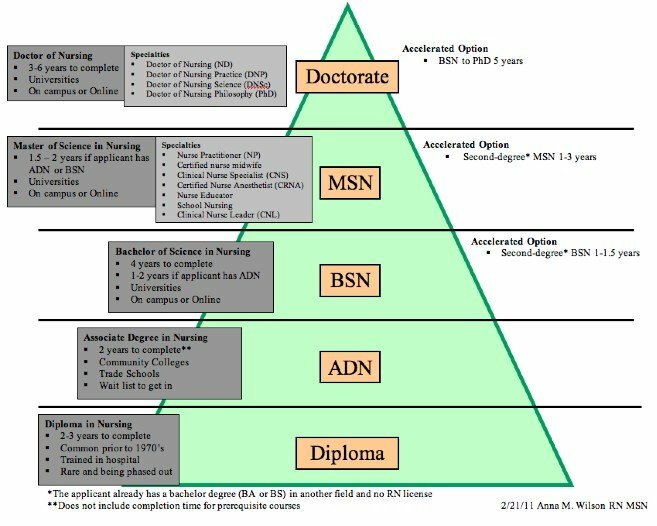 Nurse Journal has made a pyramid of all the education degrees you can follow, together with information about how long each degree can take and how it can help you. Although at the moment, most new nurses graduate from associate degree programs followed by bachelor’s degree programs. In the near future, hospitals hoping to earn Magnet status will need to increase their BSN workforce to 80%, The American Association of Colleges of Nursing predicts. If you’re interested in more responsibilities and better-paying positions, it is advised that you follow the route toward getting your Bachelor’s Degree in Nursing (BSN/BDN). By applying to either a full BSN program, which does not require prior nursing experience or an accelerated RN-to-BSN Program for RNs who already finished an ADN program and are licensed, you can make sure you will receive the qualifications that make for a stable future career. What is the Highest Position or Level for a Nurse? If you’re interested in climbing to the highest that nursing can offer, you might be interested in becoming a Chief Nursing Officer or Executive, which usually works under the CEO of the hospital or agency and has administrative and supervisory roles. This is a position that requires a master’s’ degree or higher along with high organizational and administrative skills. However, this type of position does not focus on patient care, so it shouldn’t be a decision you take lightly. On the other side, if your passion is caring for patients, you might want to become a Nurse Manager or Nurse Supervisor, which is still a leadership position, but focuses more about patient care and support, as well as hiring staff. To get into one of these roles you will require a master’s degree. Nursing is not just about changing bed sheets and making patients comfortable. A nurse has to be able to treat the sick and injured; offer emotional support; communicate with patients, patients’ families, and other healthcare professionals; make sure all the paperwork is in order; and provide information and advice to both doctors and patients, as well as provide follow-up care. This is a demanding career that requires patience, dedication, and the desire to constantly keep up with new practices in the medical field. The nurse administering an IV Drip. What Nursing Specialty is Most in Demand? 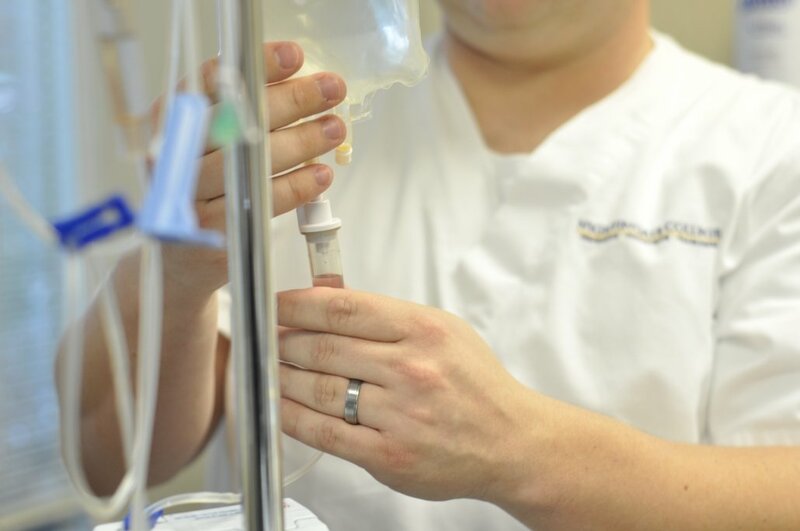 Certified Registered Nurse Anesthetist: They work closely with doctors, surgeons, anesthesiologists, dentists, and podiatrists to ensure anesthesia medications are safely administered. For this position, the minimum education requirement is a bachelor’s degree, after which it is strongly recommended to advance your education further. Certified Dialysis Nurse: One of the quickest growing specialties, dialysis nurses work in clinics and are in charge of the entire dialysis process, which is meant to remove waste products from the body when kidneys can no longer work properly. The big plus of this job is that it offers regular working hours. Nurse Researcher: Nurse researchers study several aspects of the healthcare spectrum as well as different illnesses, through scientific methods. They are scientists and focus on analyzing data and reporting their findings as well as writing in medical journals and publications. Nurse Case Manager: This is the perfect job for nurses who feel like caring for patients is not enough and need to offer further support. Nurse case managers monitor a patient’s progression and evaluate their case in order to find the most efficient cost-effective route of treatment while working closely with insurance companies. Certified Nurse Midwife: Another job that is extremely popular is that of a nurse midwife who is in charge of delivering babies and providing pre- and post-natal care to mothers. Surgical Nurse Practitioner: Once an entry-level position and today, one of the most demanding and appreciated specialties as it requires a strong set of skills, surgical nurse practitioners provide medication, asses healing, help patients set recovery goals, make sure the patient has a relaxed demeanor and mindset. This is also the largest group of nurse practitioners. A surgical nurse practitioner can also specialize in several fields such as cardiology, orthopedics, and pediatrics. Even when it comes to general job security and job demand on all fields, nursing is at the top of the list. US News includes 3 nursing specialties in their top 26 careers with the most jobs security, more precisely nurse midwife, nurse anesthetist, and nurse practitioner. A nurse’s paycheck can greatly vary depending on the specialty, the level of training and the degrees they hold, as well as the state in which they reside. An average annual wage can be anywhere between $25,000 and $150,000. Experience, education, training, other certification not only weigh in but make all the difference. While a certified nursing assistant (CNA) earns on average $27,520, an LPN or LVN will make around $44,090. Once they advance in their training, an RN’s average salary will climb to $68,450, while BSN-educated nurses are the top 25% earners in the field, as the BSN Nursing portal points out. What is the Highest Paying State for Nursing? In 2017, the highest paying state for RN positions has been California, with an average annual RN salary of $102,700, followed by Hawaii with $96,990 per year, DC with $90,110 and Massachusetts with $89,330 per year. In the same states, registered nurses with a BSN degree gained an average of $125,430 (California), $117,370 (Hawaii), and $109,560 (Massachusetts). Find out everything about nurses salaries by state! We even included an analysis adjusted to the cost of living for each particular case. What are the Highest Paying Nurse Specialties? Even though you can upgrade your paycheck with further training, regardless of the specialty, there are a few jobs that tend to have a higher paying scheme. Will Nursing Be in Demand In The Future? Besides the predicted shortage of nurses by 2022, BLS also assures that employment of registered nurses is projected to grow total of 16% by 2024, compared to the 2014 numbers. This type of growth is much faster than the average growth for all occupations, securing jobs for all nurses for years to come and making it one of the most stable career paths. Start your nursing career with the right BSN education!